All-wheel drive lock mode can be used when a large amount of drive power needs to be applied to all the wheels, such as when the vehicle gets stuck in mud and you need to free it. The torque of the engine is distributed to the rear wheels to the maximum extent possible in accordance with driving conditions. Pressing the switch again cancels all-wheel drive lock mode and returns the dynamic torque control awd system to normal mode. 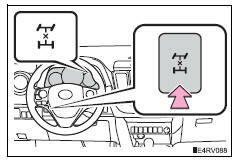 All-wheel drive lock mode is canceled when the brakes are applied to ensure the abs and vsc systems operate effectively. All-wheel drive lock mode is canceled when the vehicle speed exceeds 25 mph (40 km/h).